April 1st Abalone Watch volunteers will patrol the bluffs and headlands of the new Coastal Trail on former Georgia Pacific property while the city will have a police cruiser parked at the entrance to Glass Beach. This visibility will, hopefully, act as a deterrent to possible rules violations. There are going to be 13 minus tides in the month of April alone. 300 divers a day or more are expected to pick over Glass Beach during these low tides. That equates to 11,700 legal abalone taken during less than half of April! It is estimated that 200,000 to 250,000 legal abalone are picked in Sonoma and Mendocino Counties each year. Mendocino Abalone Watch held their annual volunteer sign-up and orientation session. Pete Kalviss of California Fish and Wildlife Service, gave a brief presentation about the biology of abalone and the state of the fishery while Bill Lemos explained the complex laws and regulation changes. Notable are the 2 new Marine Life Protection Areas which should be posted soon. California Fish and Wildlife Service began to offer a new online harvest reporting service starting December 1 2012 for abalone report cards. Abalone Watch co-founder Charlie Lorenz of North Coast Discoveries developed a CD with additional regulations, information and a test for MAW volunteers included. 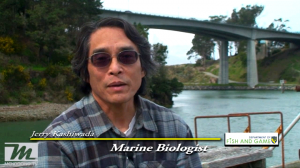 Charlie is also the host of Mendocino TV’s “The Abalone Hunter” and will be reporting all the latest news about this precious North Coast mollusc on mendocinotv.com.